125th – Parents of special children are nothing less than Oceans. We all have a well of emotional wealth in us. But I think parents of special children carry seas within. And only the fish swimming in those seas can know how they are somehow managing to swim ashore daily. Shravani Nandkumar Kharade (8). A special child. And a very special daughter, to her doting parents. She is a student, at ADAPT, Bandra West. Shravani’s father, Nandkumar (35), is employed with the BEST public mass transport. He is a Conductor. They live in Kanjurmarg. I found Nandkumar appropriate for the job he ‘happened’ to get employed as, a passenger bus Conductor. His father was a BEST bus conductor too, and died on duty. In such cases, I was told, the BEST, an organisation with a heart I also thought, offered Nandkumar employment as a Conductor. He said, it’s termed as a ‘Pity’ case, helping the deceased soul’s family member become a breadwinner. Nandkumar had a calm demeanour, and a smiling face. Also, he was quite short in height, and I thought someone like him as the Conductor can be calming to have in an overcrowded bus. And being short in height and very thin, he can easily move through an overcrowded bus, without stepping on our toes. He was agile, and very alert. So important that could be, I thought, for a professional who has not only to sell and punch the ticket, but also keep an eye out for pickpockets and eve teasers and punch them if shove comes to blows! While Nandkumar spoke about his job and responsibilities, I began to think of him, a BEST Bus conductor as our brother on board. Someone we hopefully can depend on if we are the target of a pickpocket or a pervert. I recollect something my mother had told me from her teen days when she was a teen living in Rawalpindi and later in India, before and after partition of our subcontinent, when her family was forced to migrate to Punjab on the Indian side. My nani, grandmother, had cautioned her, “Do not travel in a Bus unless you see that the Conductor or any one passenger in the bus is a Sikh. (My mother was not a Sikh, but a Punjabi by caste and birth) The Sikh will protect your honor if you or any woman passenger will fall upon any kind of danger. One Sikh is equal in bravery and courage to more than ten men. ‘Ik Sikhh dus de barabar’…” Those were the years our borders were rife with violence on both sides, perpetrated equally by all, and by criminals and thieves. Women are not the only targets. I recollect now, when I was a teen, I was once travelling in an overcrowded Bus and was touched inappropriately by someone. Initially I did not realize WTF was happening to me, who the F was ‘feeling’ me! Disgusted and shocked, I looked around at the towering adults, they were all males, and I just could not fathom looking at their faces through my teen-innocence-eyes and perception who the F had ‘touched’ me!! Soon, after struggling to not just ‘understand’, what that strange and lingering touch really meant, but also confused and soon I was angry. I had to get off at my stop and could not identify who had done that to me, and that had made me very angry. In retrospect, I think I got angry then because I must have realized that pervert got away committing nothing less than a crime, because I had felt humiliated, invaded, hurt, in hindsight, for no fault of mine. On the subject of Bus Conductors, and on a lighter tone, Mathew, a cyclist pal of mine, gave an informal talk about his experience of BEST conductors, and even about how because he is ‘white’ skinned, he gets ‘special’ treatment. Here is the link to Matthew Daniels’s experience of Mumbai’s BEST conductors. Mathew is a foreigner, so I enjoyed his ‘outsider’s’ perspective to our everyday happenings. Returning to Shravani, special child and daughter of Nandkumar, she is now growing really fast, and her parents find it very hard to carry her for school and for her physiotherapy. Both are confident she will walk and speak within a decade. Shravani’s father told me lots of things about his daughter, out of which two remain etched in my consciousness. One, “She is a happy child. However, when my wife and I sometimes argue over stuff, Shravani gets upset, and sad. We can’t see her live the rest of her life in a wheelchair. And most definitely we can never see her upset or sad. We want her to know only happiness. Therefore, my wife and I have made a solemn pact. So, we no longer, never, argue about anything in front of our daughter. Long after Nandkumar had gone away with the brand new wheelchair for his only child, I thought about Nandkumar and his wife’s decision to reserve all their resources for her alone, by not having a second child. It is not just about making ends meet. I think it’s a lot to do with the immense emotional wealth needed. Many of us, however well off or less off we may be, may lack emotional wealth, the courage to bring up a special child. One NGO told me, in many homes, the man abandons the marriage on having a special child. The divorced mothers are always left with the special child to look after single-handedly for life. Because, men rarely will marry a divorced woman having a special child. A lot of courage, emotional wealth is needed bringing up one. We all have a well of emotional wealth in us. But I think parents of special children carry seas within. And only the fish swimming in those seas can know how they are somehow managing to swim ashore daily. With their special children swimming in oceans of daily challenges. Thank you to dear Varsha Kalani for donating this new wheelchair to Shravani. Nandkumar contributed a little towards its purchase. This donation is dedicated by Varsha for darling niece Nysa Chhabria (3)’s Bday which was on April 3rd. Happy Bday to Nysa from all of us. Thank you to Himanshu Shah’s Health Care Equipments Vile Parle East for the discount on the wheelchair. 124th recipient – Does he pray for the coconut trees to shed their wings, their palm leaves? “There could be someone, in this city, who prays daily, that the tall and mighty Coconut trees that dot our beautiful shoreline, shed their wings, their palm leaves, on us now and then. Because, maybe those are the only days he or she comes across an opportunity and the possibility of earning his livelihood that one day. Ex-Fisherman, and now a Broom (Teele ka jhadoo) ‘manufacturer’. Over a year, I had been observing a frail and old man sitting on pavements in Bandra west, mostly on a pavement near the shore, crafting brooms from fallen coconut palm tree leaves. I happened to notice him sometimes, while cycling or walking past him, at various locations. Sometimes I would see him carry the end product manufactured in partnership, by Mother Nature and him – Brooms, aka Teele ka Jhadoo. He would gather them in his arms, sometimes a few would fall if he had not tied them together with coir. Carrying a few on his head, few trapped under his arms, I would see him walk slowly on pavements. Probably headed to the local Kirana stores to sell them? I thought, if this frail old man had a bicycle, however slow he may ride it, he will be able to carry the brooms he crafts, with so much patience and intricacy, easily. An old used Blade is his only tool of work, I noticed, and some quantity of coir; the rest benevolent Mother Nature provided. Thank you. I also realized, on a bicycle, this old man will be able to travel to faraway places, like Band Stand or even near the Sea link approach road, where I have seen coconut trees. At the age he seemed to me, Band Stand is certainly a faraway place from Carter road, where I would see him occasionally. Later I found out, he is 82. I decided to stop and ask him, if we gave him a bicycle, how it will help him, and if he would like to own one of his own? He seemed too poor for me to even attempt to ask him to contribute any amount towards the bicycle’s purchase. I avoid acting out of ‘pity’, because it may show in my tone and words, and sometimes the recipients have taken offence. I too have learnt along the way helping my donor pals help a few people over a year now. Honestly, this time I did act out of pity. Sorry. Naik was once a fisherman. He entered the fishing profession when he was 18. His job has always been to cast the net and draw it in once the fish swim into the same. He has fished only in the waters off Ratnagiri coast. He says that is where the best fish are and mostly all the trawlers from Mumbai region travel to Ratnagiri to catch fish. In his humble opinion, even if you travel to Sassoon Docks at Colaba, or any other fish market at Bhaucha Dhakka or Danda or Versova, at 6 am for fresh fish, the ‘fresh’ Pomfret and other gourmet fish we buy ‘fresh!’ arrives to us only after a journey of 5 to 6 days, sleeping-dead on huge beds of solid ice. So, I guess there is no concept of ‘FRESH’ fish in Mumbai. Unless, we, like Naik once did, and several thousands of fisher-folks still do, leave our comfort zones and travel on their trawlers and catch the fish in the sea and cook it on board. Like these lucky fishermen can do! Or have to do. When Naik got old, I mean too old to fish, since more than a decade he has been manufacturing brooms – ‘teele ka jhadoos’ , from fallen coconut palm leaves. Palm leaves that we often find scattered on our pavements or to our horror find fallen on our parked cars at times! One dented my brand new car once! Naik manages to manufacture about 3 to 7 brooms a day. He sells each at Rs 60 or 70, I think. Not on all days can he ‘manufacture’ his product of livelihood. Because, he competes with the BMC. The BMC carts away the fallen palm leaves, because they too utilize these fallen angels to make brooms, which they distribute to their staff to clean our streets. I realized, the hundreds of beautiful Coconut trees that sway in high winds on our shores, they help keep our homes and cities clean! Thank you. I decided to research other values of the Coconut Palm leaves. I found out that the Palm leaf manuscript is one of the oldest medium of writing in India especially in Southern India. Wow! I asked Naik, which has been his happiest moments in life. His happiest memory so far. Considering he is 82, what kind of lasting happy memory would someone like him depart earth with, I was keen to know and share with you. Long after he had left, I decided never to crib about the noise pollution and traffic jams during Ganpati immersion days. Some souls somewhere have the fortune of seeing their loved ones only on that day, I realized meeting Naik. Maybe that is another reason why the Lord is so looked forward by millions to returns – “Pudhchya Varshi Lavkar Ya”, so that someone somewhere can be reunited with his or her loved ones. One last thing. I realized only after having given him the bicycle, that Naik may be homeless. Because, I found him sleeping at a cobblers space in Rajan Sherley Street when I would happen to pass that location. I found out, Naik arrives at that spot only when the cobbler leaves for his home in the evening, and he leaves the cobbler’s space in the morning when the cobbler returns to work. Naik to me seemed to me literally sleeping on an illegal-platform of Kota stone raised from the pavement. No wonder, in the afternoons sometimes I had seen him sleeping in the shade of trees on carter road. Those very trees that feed him. Rarely do we not take a single paise from the recipient of our donor’s charity. This is one of those few, I felt so glad, seeing him resting for the night thanks to a cobbler’s kindness. We all need to be a coconut tree or a cobbler for someone. Thank you Ritu Chhabria, and Geetali Tare, for purchasing this bicycle for Naik. Our bicycle angels. His bicycle was stolen a few days ago. He roamed the streets a couple of days to test his luck, he was hopeful he may come across his stolen bike. His luck and the bike, both evaded him. Exhausted and hopeless, the three people he approached for assistance in helping him find a good condition second hand bicycle (one was a bicycle shop near his house, and the other was a fruit seller, and the third a flour mill worker) all three informed him about us. I was surprised! They told him that we people may be able to help him buy a new one, provided he too contribute substantially towards its purchase. That is how he arrived at our threshold. Naturally, I welcomed him. Shravan is educated until the tenth class, and his father was a Dhobi too. He has two brothers and two sisters and all are settled and married. He has four children, out of which one is a special child. Shravan had wanted to be a soldier, work in the Military, and he applied for the job too. But due to some medical problems his medical examination got delayed, because of which he missed the eligibility period by three days! Three sunrises, three sunsets, set the sun on his childhood dream of serving the nation, he lamented. While he spoke about his defeated dream, I remembered my own past. I too had wanted to join the armed forces. The NDA. National Defence Academy, near Pune. When I approached them to fill the application form, they told me to return post the 12th standard. After I finished the 12th, I went back to them to apply, and on seeing my date of birth they told me I was overage by less than a year. Those few words spoken softly by the officer sounded louder than a fighter plane crash to me. Because, my dream to become a fighter pilot had just got grounded forever. So I could empathise with the ambush of Shravan’s dream by his destiny, as he sat in front of me eyes cast downwards in silence. However, soon, new dreams took wings, and I was on my own flight to becoming an Electronics Engineer. Even Shravan, put the crash of his military dream behind him, and adapted to his father’s profession, and since then he has been a Dhobi. No regrets now, as the profession has given him a life of good monetary worth and respect. Though Shravan could not wear the military uniform, he remains fiercely patriotic. He had very strong views on why our politicians do not give our neighbour a fitting reply, when our soldiers are killed by them in unprovoked firing, or killed by terrorists from abroad and from within our own home. To protect your borders, even if my life were to halt or pause. I will seek your safety on bended knees. Though from engagement with an enemy I’ll not shy. I’ll still do whatever I must more than ably dare. Shravan continued to speak….. towards the end of our meet told me he has a ‘mentally challenged, or what most term as ‘handicapped’ child. The child is growing older, he is 9 now, and because he can neither speak nor walk they have to carry him thrice a week to Haji Ali, KEM, and other places for his physiotherapy. He is getting heavier as he is growing older, but they cannot afford to buy him a 5000 to 7000 rupees wheelchair. 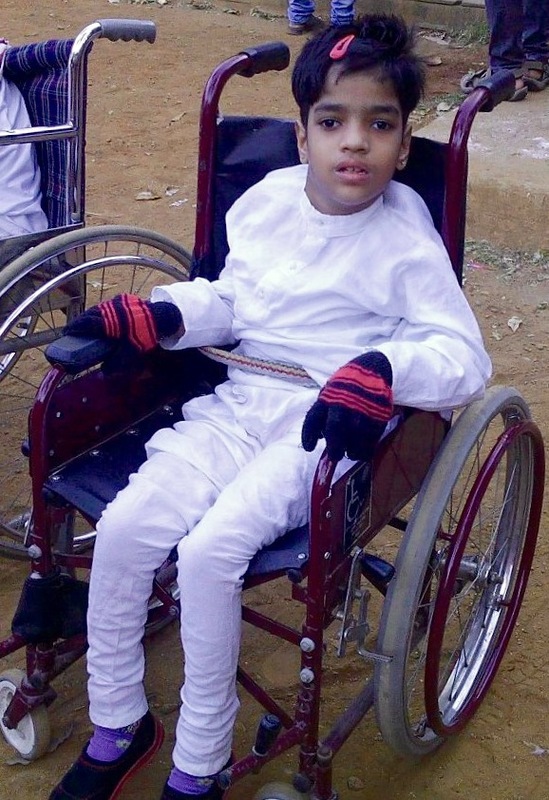 Now, Shravan had no idea that we have also donated wheelchairs in the past. He did not ask us for help to buy his son a wheelchair. That is when I decided, not only are we going to help Shravan get a new bicycle, we are also going to help his ‘disabled’ child own a wheelchair. My friend, Varsha kalani, had been waiting in the wings since long now, to buy a wheelchair for someone, so I decided to seek her help finally. Moreover, it had been some time now that we had donated a wheelchair. Shravan’s destiny sent his son to us, I thought, even though she took away his livelihood bicycle. But she did that so that he may be able to find us, and in turn for us to be able to find his under privileged child who needs a wheelchair. Strange, indeed, are the ways of destiny. Salute. And just a long case of serendipity. One wheelchair coming up, soon! 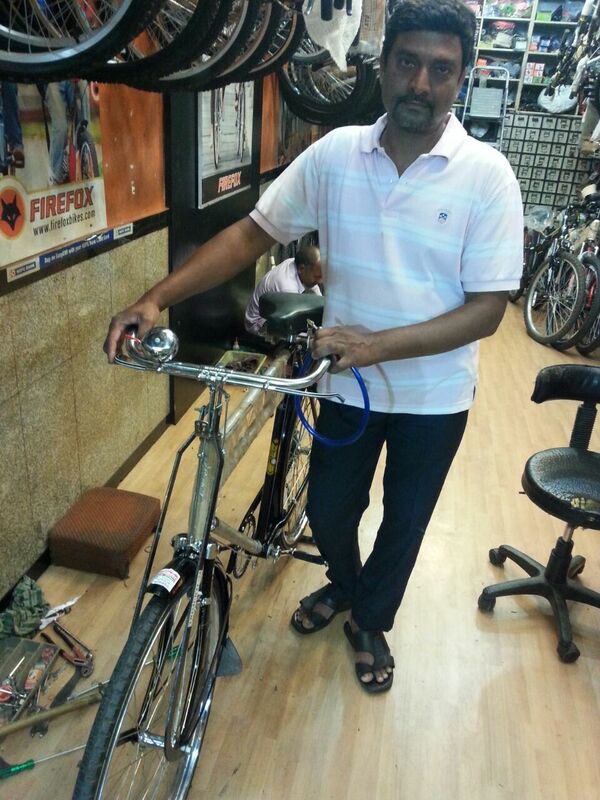 Thank you to Dinyar Gilder and ‘Bounce Gilder’, woof woof, for purchasing this bicycle for Shravan. Shravan contributed towards its purchase too. 122nd recipient – My over sized Heart pals are far more…. Cheers to my oversized-HEART friends. They are special for me, because they are the ones who long ago decided to be inclusive first towards themselves. Because, before you offer your kindness to others, you need to share it first with your own beloved self. I believe. Ashok is from UP; He is educated till the tenth class. He did not want to study any further, being disinterested; so his father brought him into the dhobi profession. His father was a dhobi too. Ashok has two children, both are being educated. Nearly a year ago, I think, I saw Ashok riding on an old and dilapidated bicycle. I had told him then, if he ever wants to buy a new bicycle and if he is willing to contribute nearly half the cost of the same, he should come see us. We may be able to contribute the balance. Ashok Dhobi did come see me nearly a month ago, when his old bicycle got stolen in Bandra west. In my little experience, bicycle theft is a common crime these vendors-on-bicycles suffer. Over the last one and a half years, at least ten recipients must have approached me for our assistance, in helping them buy a new bicycle, because their old bike were stolen. And at least another five recipients, who had received brand new donated-bikes from us, called me within a few weeks or months of receiving them, to inform me their bicycle was stolen. The sadness in their voice at those moments, would arrest me. Even such instances made me realize how much this humble bicycle really means to these vendors/people. Most often, the victims of bicycle theft cannot approach the Police for help. Because, they lack proof of their bike’s ownership. Many of them do not know the importance of keeping the Sale Invoice copy after they buy a bicycle, whether it’s a new one or second hand. That is why, when we buy bikes for these recipients, from day one we have handed the recipient a copy of the bike’s Sale Invoice, which is usually in the name of the donors and contributors to that bike. Siddharth Vora, the owner of Kohinoor Cycle Stores, and I, have always ensured that the recipients are handed a copy of the Sale Invoice! Speaking of stolen bicycles, a must watch film is the Italian classic – “The Bicycle Thief.” It’s about the suffering of a lower middle class father and son, the child is around 6, whose one and only means of livelihood, their bicycle gets stolen. A bicycle that is their only path to earn an honest living. What kind of pressures an honest family man can crumble under, is what this film really shines her light upon, simply through a captivating and emotional narrative. Or else, hire the DVD and watch it with your besties, or your family, or just with your very best of friends – Yourself. After Ashok had left, I opened my wallet and looked at a 500 note. I had never seen our currency so closely. Even though we value money so much, I mean, even wars take place over them, how many of us have had a close look at our currency? I counted 15 languages at the back of the note, and two on the front. The denomination is written in two official languages only – English and Hindi. Returning to our much desired currency, even though we want to be inclusive, we cannot possibly project the same on a currency note, the languages mentioned on the reverse were only 15, out of the official 22. Obviously, because no one can possibly fit even all our Gods and Goddesses in one place of worship! So beautifully and exhaustively diverse are we! Jai Hind. Jai India. Speaking of inclusiveness, “It is only human supremacy, (which is as unacceptable as racism and sexism are) that makes us afraid of being more inclusive.” – Ingrid Newkirk. Long after the guests had left, I thought about my friend’s perception about being ‘in-fashion’ and the desire for being size zero. I realized, some of my friends who are ‘over sized’ and those who are quite clueless about fashion, walk the talk with more confidence and have higher self-esteem and confidence than those who are struggling to get into their much younger siblings clothes! I cannot speak for others, but some of my overweight friends are even more giving, more empathetic, kinder, and more confident than some of those who are perpetually struggling to be in-fashion and size zero. Thank you to Ritika and Parag Vijra for donating this bicycle to Ashok. Ashok too contributed substantially towards the purchase of the same.
) Siddharth Vora (https://www.facebook.com/siddharth.vora.58?fref=ts) for the good discount and service. (PS – Rs 3000 is what it takes to donate a new bicycle; yes, because the balance, 2000 to 2500, is contributed by the recipient. DNA article on Bicycle Angels by Deven Lad. For Rakesh Anand Bakshi, being acknowledged for his gestures is discomforting. “I feel sad when a recipient thanks me for the cycle assuming that I am the donor. But that is not true. I am just a medium to bring together a willing donor and a deserving recipient,” says Rakesh, who is a writer by profession. But little does this ‘medium’ realise that his efforts are changing lives and bringing a smile on hundreds of faces for whom that bicycle means much more than a means of transport. 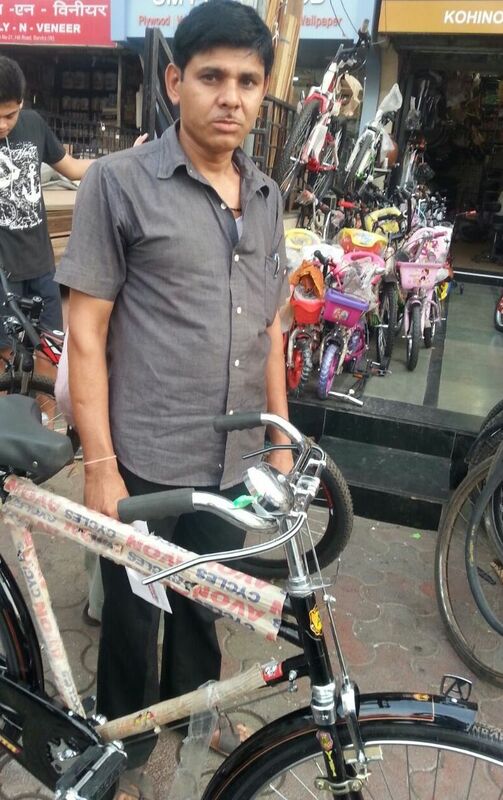 Rakesh has till date, helped 121 people by donating new as well as used bicycles. 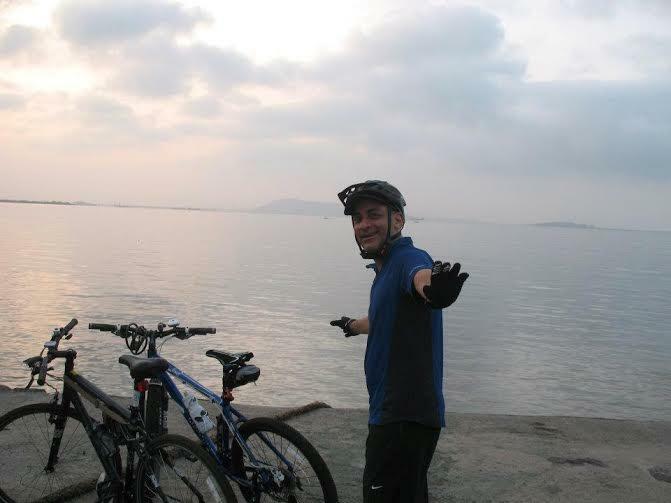 And from there on, began Rakesh’s hunt for people who need bicycles. Every alternate day, he goes around the city on a cycle and looks for potential beneficiaries of his mission. And much to his surprise, he chances upon several people like chaiwallas, dhobis, panwalas and plumbers, whom he feels, need help. While Rakesh is satisfied by bringing a smile on people’s faces and clicking pictures of happy moments spent with them, the beneficiaries of his efforts cannot help but express their gratitude. What makes Rakesh so passionate about this initiative is the fact that, a bicycle, while for most of us, might be just a means to travel, for many it is an important element that helps them earn their livelihood. 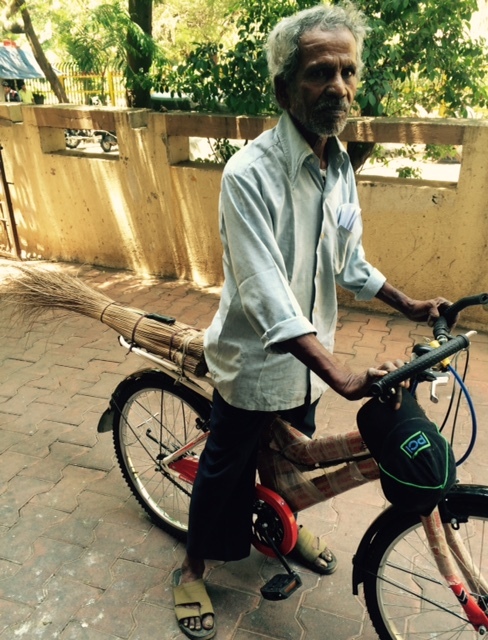 Shyam Narayan Dube, an 80-year-old milkman from Colaba is the latest recipient of a new bicycle from Rakesh.